The 63rd Eurovision Song Contest is about to take place, for the first time in its history, in Portugal, a country that had a reputation - until last year - as the competition's biggest loser. Until Salvador Sobral victory last year in Kiev, with the ballad "Love for both of Us," the Portuguese state broadcaster sent over 40 entries without even troubling the top five places. The best Eurovision year Portugal ever had, until 2017, was a 6th place 21 years ago in Oslo. But now delegates of 43 countries are spending a hectic week in Lisbon and around the country, going from press conferences to rehearsal and from international parties to excursions. Since 2004, the European Broadcasting Union asks the host broadcaster to host semifinals, in order to filter all the countries that wish to participate. Among them, two favourites: Israel and Cyprus, which may have taken Portugal's loser's mantle, having failed to win since joining in 1981. Both countries are sending upbeat pop acts, performing in English as the rules have allowed since 1999. The United Kingdom is not, once again, among the favourites, nor is Ireland. Last time a British act won the Eurovision song contest was in 1997, with Katrina and the Waves, with "Love Shine a Light", in Dublin. The Irish, with their fair share of victories - seven, from 1970 to 1997 - seem less interested in the contest nowadays. This evening semifinal starts with Azerbaijan, who have one victory from their decade in the competition. The UK, France, Germany, Italy and Spain do not compete in the semi finals as they have a direct pass through to the final. The second semifinal takes place in two days, when another set of 10 candidates will be selected to the final of Saturday. Eurovision is all about suspense but allow us to cut to the chase. The ten finalists going through from the first semi-final are as follows: Austria, Estonia, Cyprus, Lithuania, Bulgaria, Israel, Czech Republic, Albania, Finland, and Ireland. Israel’s Netta lived up to expectations and broke the Internet with her song ‘TOY’. What was it all about? We’re not sure. But that didn’t take anything from it. Austria’s Cesár Sampson provided some serious eye-candy for the night, and that wasn’t lost on anyone – least of all Australian Twitter fans. But Sampson going through surely wasn’t down to just that. And then there was Ireland’s Ryan O’Shaughnessy, who elicited so many “awwws” we knew he was on to something with his song ‘Together’. Could he put an end to Ireland’s dry spell in the Eurovision? Mikolas Josef from Czech Republic got a lot of stick for his dance, his bag, his rap song. In short, everything. But it was him who laughed last. 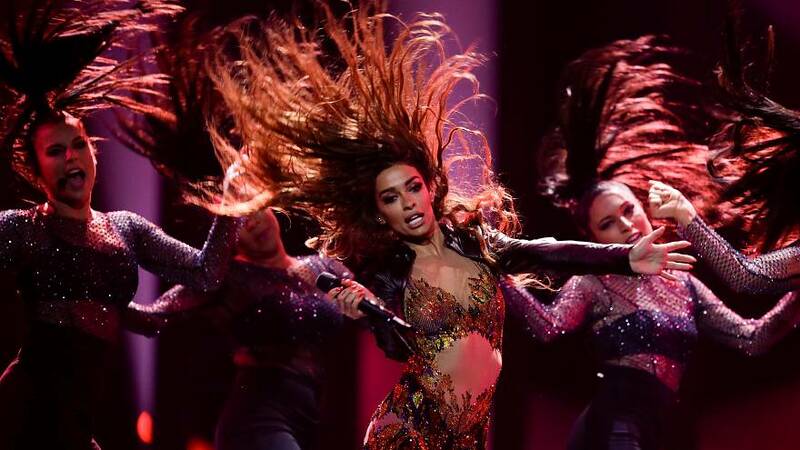 If sparkle is what wins it, Cyprus’ Eleni Foureira has this one in the bag. Her set was all hip shaking and glitter. A deluge of ballads, most of them in English, didn’t seem to go down fantastically well with the Twitter contingent.